"A Classic Jersey-ism is “regular coffee.” Here when you order a “regular coffee” at any place you trust to make a pork roll and cheese you get a paper cup of coffee with “milk and 2 sugars” rather than a “black coffee that hasn’t had the caffeine removed.” Acidic bitter coffee flattened by milk and sweetened; the perfect foil for the salty unctuous savor of breakfast on a roll. For our homage to Jersey’s breakfast beverage, we teamed up with our neighbors at Fair Mountain Coffee Roasters looking for an elevated version of classic crappy coffee. We chose Mexican Chiapas for its bitterness akin to artichoke, roasting it a little darker than usual, along with Ethiopian Sidamo for its pleasant lemon-like acidity, which we pushed up through fermentation. We added this coffee blend to a high gravity golden cream ale, contributing our “milk and 2 sugars.” Drink Regular Coffee because running over a black beer with coffee is no way to get to work." Pours a murky, dark orange with less than a finger of off-white head. Roasted, but incredibly rich coffee beans blow your hair back on the aroma. 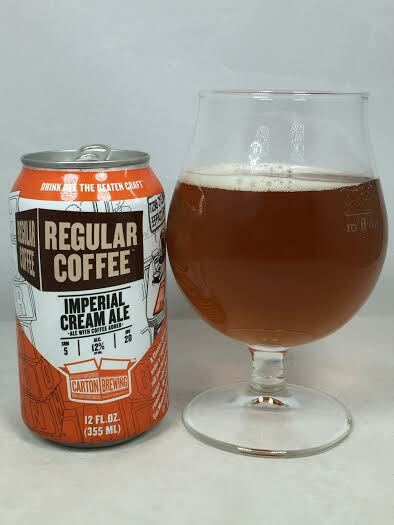 It has a creamy and iced coffee smell with even hints of wood and a nutty finish. Was I expecting much from another coffee beer? Let alone a coffee Cream Ale? Not really, but Regular Coffee has certainly just surprised me. Following in the steps of what seems to be all the rage these days, the dark-flavored, but light in appearance beer is becoming the "it" thing to do, and Carton has delivered an exceptional one. Almost smokey coffee (is that a thing) is the dominant presence which takes it a step beyond typical roasted notes (though those are abundant). Where things get interesting is in the middle and on the transition as heightened sweetness overwhelms the coffee as I get a sugary cream or even vanilla flavor which turns this into a dessert beer. As far as I know there is no added chocolate, but I swear there is a finish of cocoa powder and milk chocolate which really makes this a diabetic's worst nightmare. I think the 12% abv is a joke because you'd probably see ESPN apologize to Tom Brady before you found any alcohol in this beer. Mouthfeel is a little flat, but not thinned out or watery. It doesn't feel like a massive 12% beer and all of its dessert-like flavors make it absurdly drinkable. That 12oz can will be gone in no time. Coffee beers are a dime a dozen, so finding one that blows wind up your dress can be a challenge. Carton Regular Coffee put a delicious spin on a style that not typically known for its world class offerings. It delivers on its promised coffee, but it blindsides you with the wide range of sweet chocolate, vanilla, and cream flavors. It's so unique that it's hard to compare it to anything else, but basically, this is everything that Ballast Point's Calm Before the Storm should have been...and more.